While I love cooking Black Cod a number of ways, there are some who insist that it's best smoked. It is an excellent fish for smoking. And what better time to smoke a bunch of fish than our first big storm of the winter season! No biggie in a traditional wood fired smoker, I suppose, but ours is electric. Preparing fish for smoking is a very long process, and all the while I kept expecting the power to go out, but fortune smiled upon us amidst the heavy rain and gusting 40 knot winds! Luckily our covered porch faces north. The fish really did turn out fabulous. We tried two different brines that a good friend recommended. These are the two recipes we used, slightly adapted from the "Little Chief" smoker book to our preferences. We favor the first recipe. Brine Black Cod chunks 4-8 hours, depending on thickness, keep refrigerated. The fish will become firmer when it's ready to be removed from the brine. Pat dry and place on your smoker racks* for 2-4 hours, until a smooth skin or "pellicle" forms. The pellicle seals the surface and prevents loss of natural juices during smoking. Start Smoker using Alder for first hour; then Cherry the second hour. Leave in the smoker until drying is completed. Smoking time will vary from 2 to 4 hrs at 160 °F, depending on volume. Remember the racks closest to the burner will be done first; place largest and thickest chunks on the bottom rack. When fish is done, remove and let cool. Store Smoked fish in refrigerator. Freeze fish if it will be stored for more than a few days. Mix all ingredients (except the pepper) and stir until dissolved. Brine fish 4 or more hours. Lightly rinse and pat dry. Press coarse black pepper onto the flesh side of the fillets to taste. Place on smoker racks* for 2-4 hours, until a smooth skin or "pellicle" forms. Follow directions from the first recipe to smoke. *We recommend oiling your smoker racks before placing the fish on them to keep the fish from sticking and to make the clean up easier! Mix almonds, parsley, lemon peel, 1/2 teaspoon salt, and 1/8 teaspoon pepper on plate. Place flour on another plate. Sprinkle salmon with salt and pepper. Dredge salmon in flour, shaking off excess. Lightly brush 1 side of salmon with beaten egg. Press brushed side of salmon into almond mixture, pressing lightly to adhere. Arrange salmon, nut side up, on baking sheet. Melt 1 tablespoon butter with 1 tablespoon oil in each of 2 heavy large skillets over medium heat. 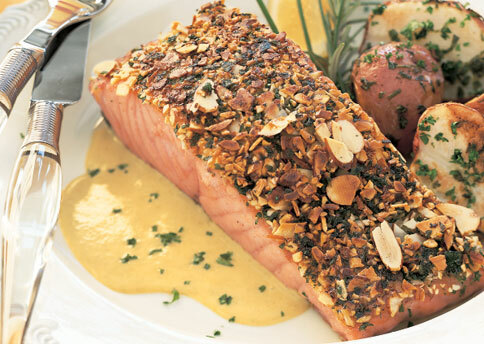 Add half of salmon to each skillet, almond-coated side down, and cook until crust is brown, about 5 minutes. Turn salmon over. Sauté until salmon is cooked through and opaque in center, about 5 minutes. Transfer salmon to plates. Reheat sauce, stirring over medium heat. Spoon around salmon and serve. Preheat oven to 425 degrees F. Lightly spray a baking dish with nonstick spray. In a small bowl, whisk together the butter, lemon juice, garlic, salt, and red pepper flakes. Stir in the capers. Place the cod fillets in the baking dish. Pour the butter mixture on top. Use a brush if needed to evenly distribute the thick sauce on top of the fillets. Sprinkle with the paprika. Bake, uncovered, 15 minutes (25 minutes if frozen), or until fish is white and flakes easily with a fork. This recipe works well with any firm-fleshed white fish, including halibut. If you have frozen cod fillets in your freezer, don't bother defrosting them prior to baking - you can absolutely bake fish fillets frozen and it's actually easier not to over-dry them when you bake them from frozen. Simply add 5-10 minutes to the cooking time. Hank Shaw's food blog is an incredible resource for seafood recipes relevant to the Mendocino Coast. I find myself constantly recommending his blog, Hunter Angler Gardener Cook, to customers looking for advice or new ideas on how to cook their fresh fish. 2. Place the cod fillets in a single layer in a shallow baking dish; pour about 1/4 - 1/3 of the teriyaki marinade over the fillets. Cover with plastic wrap and place in the Refrigerator. After 15 minutes, turn the cod fillets over to marinate the other side; cover and refrigerate another 15 minutes (for a total of 30 minutes of marinating). 3. Heat 2-3 tsp. of vegetable oil over medium high heat in a large sauté pan. While heating the pan, remove the fillets from the marinade (reserve the marinade for later). Place the fillets skin side up in the preheated sauté pan and cook without moving for at least a minute. Release the fish gently with a spatula and when the pieces start to brown lightly on the bottom (about 2 minutes), very carefully turn the them over with a spatula and cook on the skin side for another 2 minutes until the cod is cooked through. Remove to warm serving plates and place in a warm place (ie, warm oven). 4. In the same pan, add the reserved marinade to the pan, along with the remaining teriyaki sauce. Bring to a boil over medium high heat and cook for about 10-15 seconds. Remove any foam that forms. Stir in the cornstarch or tapioca slurry and cook another 10-15 seconds until the sauce has thickened slightly. Remove from heat and pour the teriyaki glaze in a bowl. 5. Drizzle some of the teriyaki glaze over the fish and garnish with sliced scallions and sesame seeds. Serve with extra glaze on the side (in case anyone wants more), steamed white rice, and your veggies of choice.